Those of us learning Chinese are fortunate to be doing so nowadays: There are oodles of courses, apps, and other online resources that you can use to improve your Chinese. Mandarin Weekly has partnered with a number of different vendors to help you jump-start your Chinese with the best solutions we can find. In some cases, we’ll be giving away copies of books and software that we think will help you. But even if you don’t win our giveaways, you can still benefit from a variety of great deals. Just use the special Mandarin Weekly offer codes listed here to get discounts! If you know of a high-quality app, course, or other resource for students of Chinese, please contact us! We’d love to provide our readers with discounts, and will continue to grow this list over time. My Chinese textbook is pretty good, but the stories in it are rather dull. Fortunately, The Chairman’s Bao is an easy-Chinese online newspaper (Web and mobile) that not only regularly publishes interesting stories in simple Chinese (marked by HSK level), but also provides you with translation, identifies grammar patterns, and even lets you listen to the story read out loud. TCB has become a regular part of my day; I’ll typically try to get through a story or two each day, to improve my reading and vocabulary. The stories are generally interesting and entertaining, and give me a better sense of Chinese culture, not just the language. To get 35% off a subscription to TCB, simply enter the discount code “mwtcb2017” at checkout. Go to http://TheChairmansBao.com/memberships to sign up! Du Chinese is a smartphone app that helps you to improve your Chinese reading and vocabulary. It lets you choose your level (from newbie to advanced), simplified and traditional characters, and also reads stories out loud to you — so you can check your listening comprehension, not just your reading comprehension. Get 20% off of the pro version of Du Chinese if you use the MANWEEK coupon code at checkout! I’ve been taking classes from eChineseLearning.com since July 2014, and I could not be more satisfied. My main teacher (Grace) is patient, helpful, and knowledgeable, and doesn’t seem to mind that I constantly ask her questions that aren’t quite in the syllabus. ECL is affordable, flexible (with many teachers, whom you can choose via their Web site), and is responsible in many ways for my feelings of accomplishment when I fly to China and communicate in Chinese with the locals. I’m learning to read, write, speak, and listen, and I’m having a good time when doing so! If you sign up for a three-month course (or longer) with ECL, and mention my name, then I get a free month and you get a free week. If you’re looking for live lessons, I definitely recommend eChineseLearning.com. Definitely an excellent choice for busy or homeschooling parents who want their kids to have some fun learning basic words in Chinese or even for adult learners of Mandarin at the beginning stages. 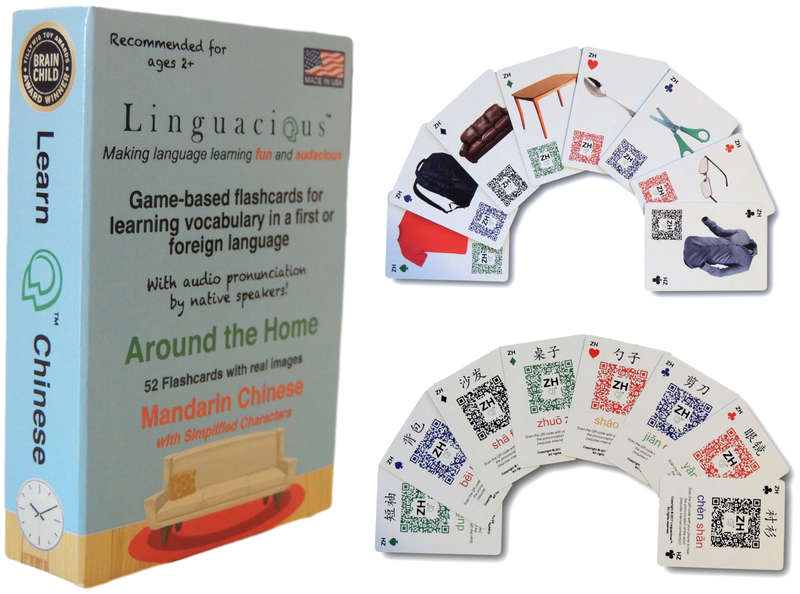 Use code REUVEN10 during checkout on Amazon USA to get 10% off their Around the Home Mandarin flashcard game. The first 20 Mandarin Weekly readers to use the coupon code MANDAW88 will get 50% off of any premium Ninchanese subscription. This is good for the first 20 people to use the coupon, so don’t delay! One of the most importan t parts of learning Chinese is the pronunciation. Many of the sounds are quite different than those in Western languages, and if you then add the tones on top of it, it’s even harder. Getting feedback on your speech is important at all stages of learning. Speechling is a company whose app and Web site are designed to help you improve your pronunciation. 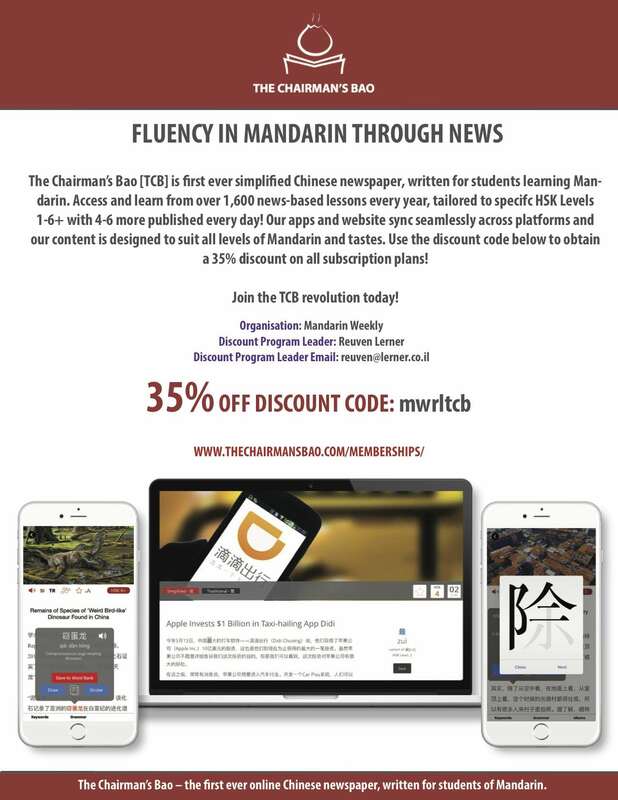 You can get 10% off a Speechling subscription by mentioning Mandarin Weekly and using the “MW1010” discount code. Another online Chinese school, Touch Chinese, is offering a $25 discount on any 1-on-1 tutoring plan. Just use the discount code “mandarinweekly”. Want to improve your reading of Chinese characters? Zizzle App works on your mobile device (Android and iOS), and uses research-proven techniques to help you learn and remember characters. Use the coupon code MANDARINWEEKLY to get 15% off of the price of Zizzle App. Go to the Zizzle App site to learn more, and to download your own copy!